A ticket stub for Rock Super Bowl V, featuring Jimmy Buffett (b. 1946) and The Coral Reefer Band, The Steve Miller Band, The Little River Band, Randy Meisner (b. 1946), and South Paw, at the Tangerine Bowl in Orlando, Florida. The concert took place on August 5, 1978, and was presented by the Beach Club. The ticket price was $10, including tax. From 1977 to 1983 the Tangerine Bowl hosted a series of music festivals known as "Rock Super Bowls." The Tangerine Bowl has also been known as Orlando Stadium, the Citrus Bowl, Florida Citrus Bowl Stadium, and is currently known as Orlando Citrus Bowl Stadium. It opened in 1936 and has been home to numerous sporting and entertainment events throughout its existence. The Tangerine Bowl is located at 1 Citrus Bowl Place in Orlando. "Tangerine Bowl: Rock Superbowls, Orlando, Florida." Orlando Rock Super Bowls. http://rockshowvideos.com/rocksuperbowlshome.html (accessed February 23, 2015). Gramm, Lou, and Scott Pitoniak. Juke Box Hero: My Five Decades in Rock 'n' Roll. Chicago, Ill.: Triumph Books LLC, 2013. 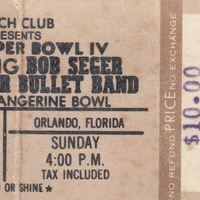 “Bob Seger & The Silver Bullet Band Ticket Stub.” RICHES of Central Florida accessed April 24, 2019, https://richesmi.cah.ucf.edu/omeka/items/show/4774.